Gear Reviews. Green Hour Connection. Most parents would agree that biking is great for kids. It’s great for exercise, self-esteem, and even the environment. But despite all the benefits, a lot of parents are unsure how to get their child started in the world of biking. And thanks to a lot of great products out there, your child might be ready to hit the road (or track…or dirt) sooner than you think. Here’s a few gear staples that our family has relied upon throughout the different stages of learning for each of our children, along with the ideal ages for each. 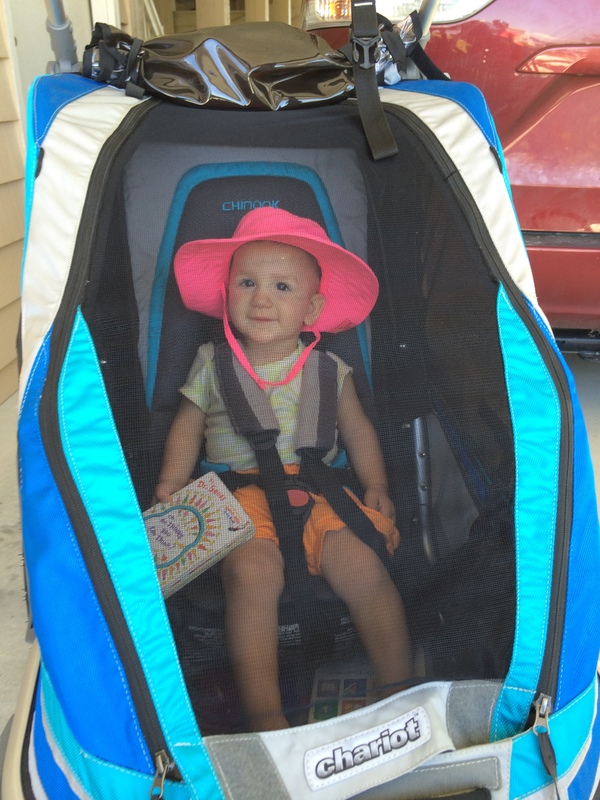 14 month old Baby Zu getting ready for a beach ride. 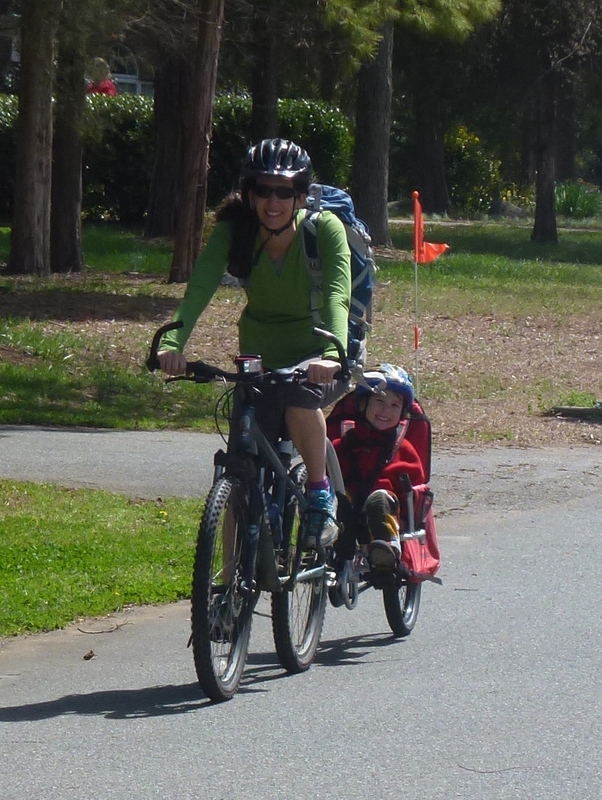 BIKE TRAILER (<1 to 4): If the whole family likes to bike, odds are good that your child’s first biking experience will be in a trailer. Our first trailer was a Chariot Cabriolet (reviewed here), which we received as a Christmas present when Big C was 9 months old. Baby Zu took her first ride around that same age in our newer Chariot Chinook (reviewed here), but since she was significantly smaller than her brother at the same age, we rigged it with her infant carseat for the first few months (as a disclaimer, that was our idea, not Chariot’s, so use your best judgment.) The bike trailer was a must-have for family outings throughout the preschool years. It has shown our children that biking is fun as well as functional, since our most common usage with it has always been commuting to school. BALANCE BIKE (18 months+): Big C got his first taste of two wheels at age 2…but his interest was hit or miss until he was exposed to the “good kind” of peer pressure from an older friend at age 3. In my opinion, balance bikes are THE best way to teach your kids how to ride. The idea is simple, but brilliant – no pedals to deal with allows your child to focus solely on balance. Once he/she’s got that part down, the transition to the big kid bike is smooth and seamless. 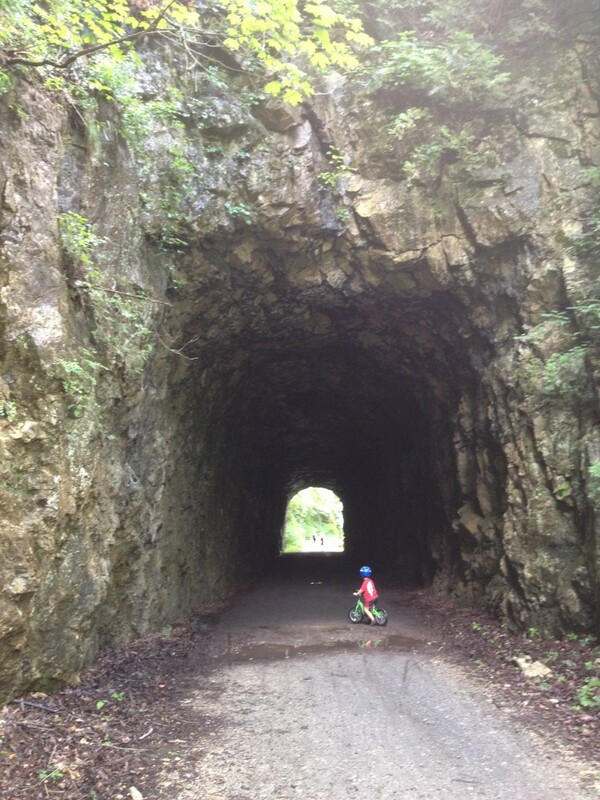 3 year old Big C (balance) biking his way through the New River Trail tunnels in VA.
TRICYCOO (18 months+): This innovative product from Joovy is the newest addition to our arsenal of biking gear. (And while provided for free for purposes of this review, all opinions expressed are my own honest ones!) It’s designed to be there for both you and your child during each stage of learning. We never had a trike for Big C, but now that we have this one for Baby Zu, I don’t know how we ever lived without it. 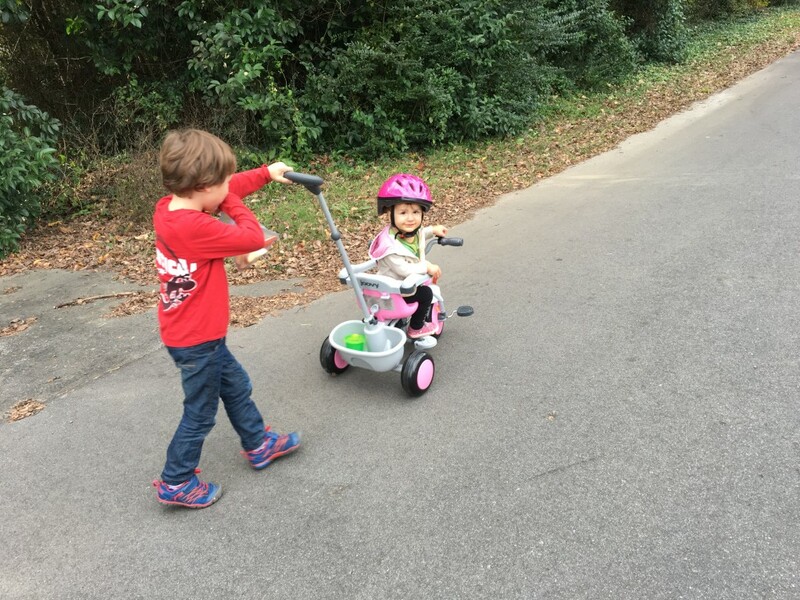 With an older brother constantly zipping circles around her on his bike/scooter, the Tricycoo lets Baby Zu feel like she’s a big kid too. 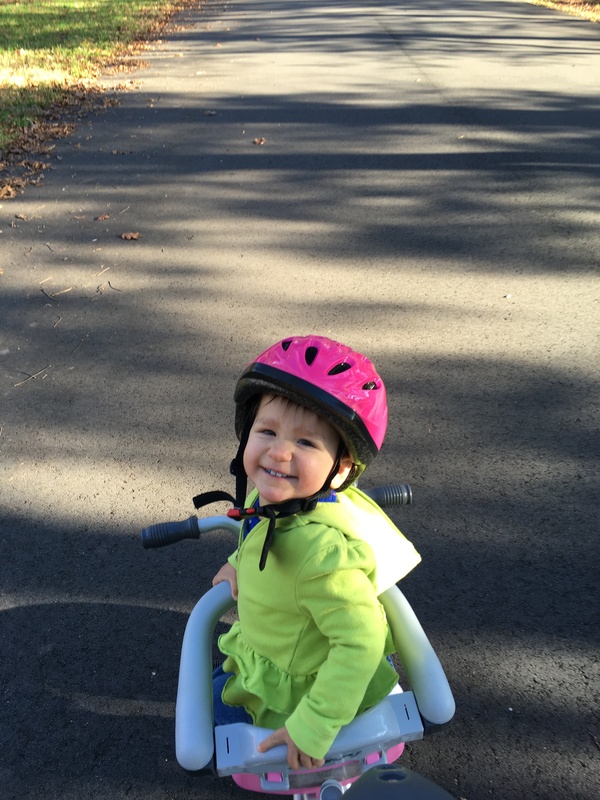 With the bike trailer/stroller, she’s merely a spectator on family outings, but the Tricycoo allows her to be an active participant. The surround bars and parent push handle keep her safe for now, and once she’s ready to start pedaling (and I can trust her to hold on! ), they are easily removable. And the Tricycoo does for pedaling coordination what the balance bike does for balance – Baby Zu will be able to focus on one skill at a time. Once she’s got both down, she’ll be ready to inherit big brother’s old 16″ ride, but for the time being, we are thrilled with the Tricycoo! Big brother taking a turn to push! 4 year old Big C and I out for a Weehoo ride together. WEEHOO (2+): If you can’t tell by the name, this one is just plain FUN! (Reviewed here.) It’s like a trail-a-bike, but much safer and more versatile, thanks to the harness system. Riders have the option of pedaling along with the grown-up or sitting back and enjoying the view….unless there’s a big hill. Then our family rule is all hands (feet) on deck to help out! It was perfect for that in-between stage starting around 4 years old where Big C was too big for the trailer, but too small for longer rides (or commutes with road traffic.) At 20 months, Baby Zu has yet to take a spin on it, but we are excited to try it out with her this spring. A word of advice on HELMETS, other than “make your kid use one,” which should go without saying! The easiest way to ensure that your kids like, or at least tolerate, wearing a helmet is to insist on it from the beginning. Right now Baby Zu is obviously not cutting tricks in her Tricycoo, but she already knows that if she wants to ride, she’s got to helmet up. We actually had trouble finding one small enough for her tiny noggin, but once again, Joovy came through for us. The Joovy Noodle fits perfectly, and has removable padding that will come in handy as she grows. In the 5 years that Big C has been on wheels, he’s always donned his brain bucket, but never really had a crash where it seemed to matter until a couple of weeks ago when a piece of gravel sent him into a flying face plant. He walked away with some pretty badass bumps and scrapes, but still had all teeth in tact, thanks in no small part to the brim of his hard hat (that now has a crack down the front and will be replaced asap.) So I’ll end this post with a PSA to wear your helmet ALWAYS – you never know when you’ll need it! Styling in the Tricycoo with her Joovy Noodle Helmet. Oh, and if you still need more reasons to get you kids into biking, this post from the archives will give you 6 more!